Download an amusing anecdote for your iPod each day. Podcasts are fast, funny and FREE. Idioms - Idiosyncrasies or Idealisms? Snobbery is alive and well in America! The Expletive Conundrum: To use or not to use? "Appearance is vital. Who would not like to look good in other peoples eyes when it comes to written English? That's why our Danish company in Scandinavia regularly uses Canadian Elizabeth Earle when something needs to be written in Advanced English"
"My name is Andrzej. I am 28 years old and from Poland. Recently I moved to London to apply for a job. Without the keen cyber-assistance from Elizabeth Earle to do my job application I would still have been unemployed"
"During my time spent at the University I received assistance from Elizabeth Earle pertaining to my English writing. She gave me a boost over the fence. 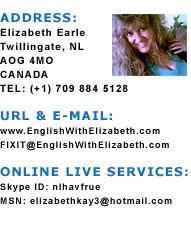 As a non-native English speaker I still contact Elizabeth for help. She is my cyber secretary when it comes to written English"
1. Don't have time to translate official documents? 2. Tired of Translators promising impeccable, mistake free documents, but failing to measure up? 3. Have a heavy work schedule with an even busier family agenda? 4. Ever feel like letting someone else translate for you, while you take a vacation? 5. Difficulty trusting unknown Translators? 6. Dissatisfied with the Translator you use momentarily? 7. Is your Translator or their company difficult to contact? 8. I am the design consultant for an English Technical Skills website. Sometimes I need to post specific instructions in clear and precise Advanced English. 9. Are there questions you cannot receive clear, precise answers to, regarding documents needing immediate translating attention? 10. Need official statistics pertaining to your Translator and their work history/background, but find only a dead end? If any of the above problems has riddled you in the past and caused unwanted Translator/Translating headaches, you have found the website that's about to cure all your language woes. www.englishwithelizabeth.com will have you on the road to flawless spreadsheets, official announcements, technical documents, personal/mass e-mails, college papers, homework, book reports and just about anything else you require. I am a freelance Danish - English - Danish Translator with very reasonable rates. In order to receive a expert, 100% mistake-free Translated Assignment, simply register with www.englishwithelizabeth.com and let ME worry about YOUR problem for awhile. You are free to sit back and take a break! If you are not satisfied with my Translation of your document, you may opt out of the contract at any time. Money back guarantees are subject to the nature of the disagreement between both parties. Thank you for visiting English With Elizabeth! If a unique example or English tip of mine has helped you with a language/writing problem, a small donation to the site would be greatly appreciated. Please use the PayPal button below to donate. Thank you so much and please visit again!